TUCKED AWAY ON A JAGGED stretch of shore south of San Francisco and north of Santa Cruz, Half Moon Bay is known as the pumpkin capital of the U.S., the site of the annual Mavericks big-wave surf competition and home to both an Arnold Palmer‒designed golf course and Pillar Point Harbor, one of the Golden State’s last commercial fishing ports. “It’s a hidden gem, but fairly easy to get to, and that’s part of the allure,” explains Susan Morgan, owner of Elegant Cheese Cakes. Second-generation florist and lifelong resident Alena Jean Barragan also credits the winning combination of unparalleled scenery, a simultaneously quaint and modern atmosphere, a bounty of fresh food, airport proximity (23 miles from San Francisco’s airport), and a wide selection of wedding venues. “You can find a beautiful place to get married here, no matter what your vision,” says Barragan. 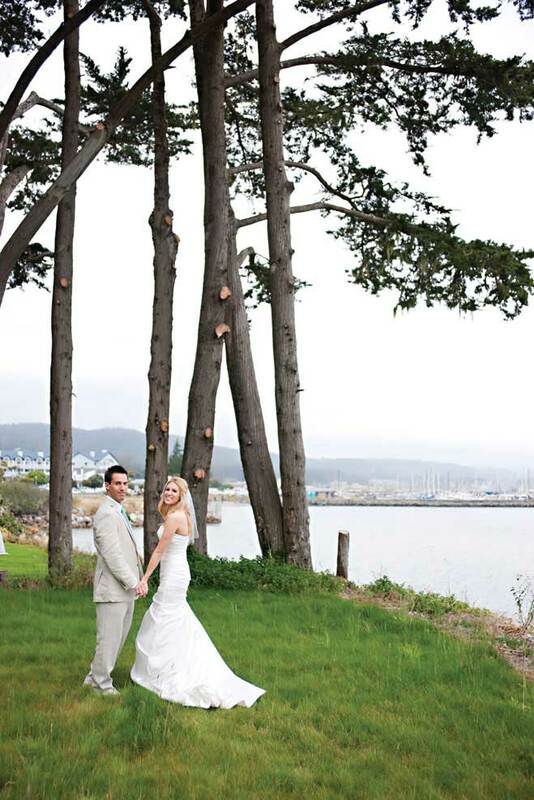 Throw in the pleasant Mediterranean climate and a long list of activities (farm tours, water sports, whale watching, hiking in a redwood forest, a coastal trail bike ride, wine tasting, art galleries) to fill the non-knot-tying portion of everyone’s stay and it’s impossible to find a reason not to let Half Moon Bay host your big day. Perched atop a grassy bluff overlooking miles of Pacific blue, this resort combines natural beauty with lavish interiors and five-star service. Ceremonies are held at two ocean- front sites, one of which features a Town & Country‒worthy gazebo. 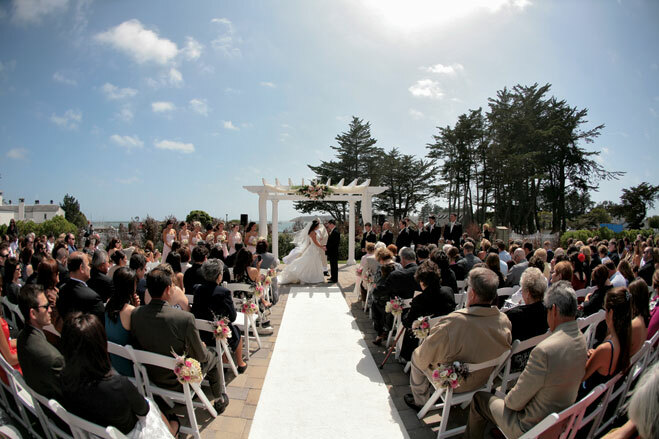 Groups of 75 or fewer can go seaside at North Bluff, while larger groups can wed on the Gazebo Lawn and retreat to the grand ballroom, with an adjoining open-air terrace that comes with a fireplace and panoramic views of the Santa Cruz Mountains. 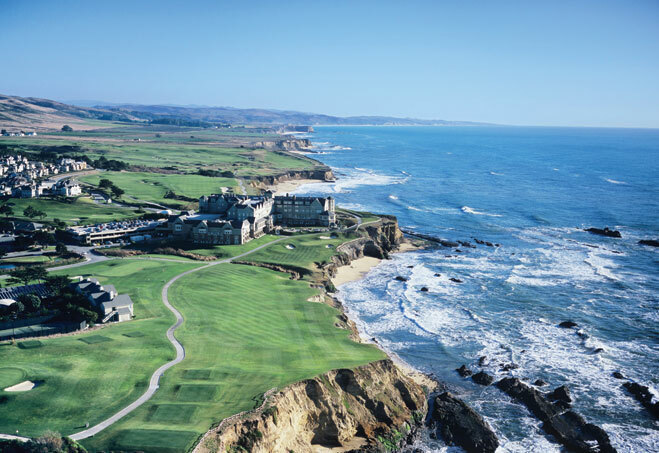 The high price tag includes access to the staff wedding specialist, accommodations, spa, salon, rehearsal dinner rooms, a French master chef and an array of Kodak- worthy spots, all under one roof. According to feng shui principles, places where land, sea and sky meet are auspicious, and nearly every one of the 300 acres on this property features this lucky combination. Even if you aren’t a believer, the manicured greens, oceanfront bluffs, beach access, ponds teeming with wildlife (frogs, egrets, ducks, oh my!) and spectacular sunsets create a picture-perfect backdrop. Ceremonies are held on the practice green or the 10th tee, which is framed by a brick bridge and sprays of cattails and lavender. Catering is provided by the onsite Mullins Bar & Grill and served in the beautifully appointed clubhouse with an ocean-view terrace. And lots of bonuses are included in the site fee, such as being chauffeured to primo picture locations by a golf cart “limo,” Chiavari chairs, valet parking and use of brand-new bocce ball courts. This shabby-chic boutique hotel offers a one-stop experience. Seeking the standard ceremony/dinner/dancing/dessert schedule? The ample grand ballroom and glass-ceilinged atrium are the answer. Want to commune with nature? Go with the harbor-side garden or beach options. Tented festivities with mountain views for up to 300 are available May through October. Seasonal ingredients harvested from the hotel’s 20-acre farm score points with foodies, while the included planners say yes to big ideas like rattlesnake appetizers or helicopter arrivals. The hotel maintains a modern selection of décor, such as framed table numbers and marine-themed centerpieces, for couples who don’t want to be bothered to hunt down their own. A Main Street staple that has been committed to the farm-to-table concept for 25 years, this two-Michelin-star Cal-Italian establishment offers multiple party rooms with capacities varying from 24 to 85 seated guests, or you can rent out the entire restaurant (234 guests max). While red leather seats, fresh flowers and sumptuous woodwork radiate warmth, each space offers unique elements, such as a Venetian mural, a breezy balcony or high ceilings. Want the signature lasagna with house-made sausage in bucolic splendor? Opt for the creek- side garden. The Music Box room’s black walls and dangling light bulbs lend an urban-loft feel. No matter which space you choose, rest assured that the house-made pastas, pizzas and desserts will delight. This restaurant, a top tourist attraction thanks to its Today show‒touted lobster roll, provides a little piece of New England. Think shake shingles, roaring fires, nautical kitsch, galvanized metal lights, one-use bibs. Soirees usually start seaside in the sand or on the lawn below the eatery and continue in one of the five reception spaces of various configurations (e.g., a glam tent on the aforementioned grass, a surf-shack- chic patio or the window-heavy indoor/outdoor terrace). Renting the entire establishment allows for more space personalization, privacy and as many as 300 attendees. The main draw is the food, locally sourced whenever possible, with the lobster clambakes being especially famous. Amazing sunsets—weather permitting—are complimentary. This converted rustic boathouse is a 2,000-square-foot blank canvas awash in natural light and punctuated with stunning harbor views from a big wooden deck perfect for cocktails or late-night lounging. The second story is a cozy spot for wedding-party prep or a couple’s private time. Make a dramatic entrance via kayak and then walk down the aisle in the freshly landscaped garden framed by cypress trees. 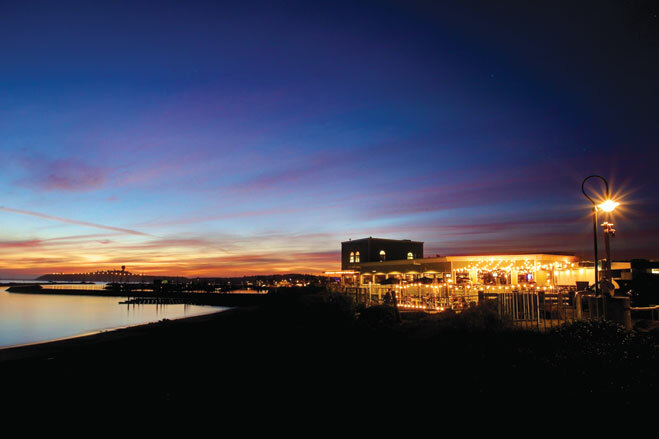 The Half Moon Bay Brewing Co., a family-friendly joint around the corner, operates the onsite kitchen, and menus are heavy on seafood and Latin flair. Yucatan ceviche and “Beeramisu” are musts. Half Moon Bay Brewing’s craft brews, one of which won bronze at the 2012 World Beer Cup, are on tap. Happen to overimbibe? Stumble next door to The Inn at Mavericks. Everything is literally coming up roses at this AAA four-diamond-designated bed- and-breakfast, run by long-married locals and surrounded by a vibrant English country garden complete with fountains, birdhouses, gazebos, white picket fences and hundreds of twinkling lights. The interiors, including the sun-drenched dressing room/honeymoon suite and dining room, are filled with ornate, vintage details, including stained glass, painted ceilings, claw-foot tubs and lacey linens. A big-leaf maple provides a majestic centerpiece for the party, ideal for fewer than 135 guests. Budget-conscious brides will appreciate the fairly comprehensive package that encompasses all six guest rooms and a morning-after champagne breakfast. History buffs, cowgirls and cowboys head for this Wild West main street attraction. Exchange vows in a country chapel, with its historically accurate pews, crosses and even wood salvaged from area churches and the adjacent meadow. While adults party in the saloon or vast reception hall (25 to 300 guests), youngsters can pan for gold, learn to rope cattle, play miniature golf or take aim on the slingshot range. There’s an outdoor kitchen with barbecues, fire pits and room for a live band. Take your first spin as husband and wife in a stagecoach or a replica of the Beverly Hillbillies car. The only limitations are the 10 p.m. cutoff time and your imagination. Housed in a historic building, this neighbor- hood bistro oozes an Old World feel courtesy of exposed beams, wrought-iron accents and crosses, frescoes and oversized floral arrangements. The real draw here, though, is the fireplace patio, a magical oasis incorporating copper, masonry, rustic sconces, glowing embers, wood furniture and starry skies. Although the menu changes seasonally, it’s always rooted in the owner’s trips to Italy and the region’s cornucopia of crops, and is complemented by an extensive wine list. An intimate party of 12 at the grandfather table is made to feel as welcome as a raucous party of 150 that takes over the entire eatery.